Improving your putting makes it much easier to reach your scoring objectives in golf. Either buy yourself a imitation putting surface - usually with a raised hole and several bunkers for effect - and lay it onto a hard surface like the kitchen, or just putt away on the carpet aiming towards a chair leg or cup. Putting on the kitchen floor is about as close as you'll come to putting at Augusta National! 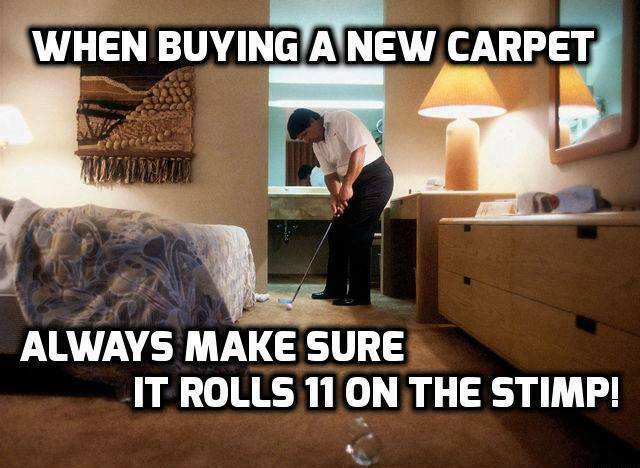 While the carpet runs pretty slow on the stimp, putting in the living room can be particularly useful to gain feel and confidence, especially if you're trying out a new putter. Another good putting drill for alignment is to putt along the skirting boards or the line of a rug to ensure you're taking the club straight back and through.